Happy Birthday to our American Flag! We love to celebrate our beloved American Flag every year with our Flag Day Celebration. The 25th Annual “Flag Day Celebration” On June 14, 2017, more than 300 people gathered together at our Home Office Building in San Antonio to help us celebrate the 240th birthday of the American Flag. This event, hosted every year by us for the last 25 years, is […]Read More Happy Birthday to our American Flag! Do you remember baking with your Grandma? “Everything is made with love and an extra spoon of sugar.” I have wonderful memories of spending summer afternoons baking with my grandmother. As it turns out, so do many of our members! Our members have shared with us treasured memories of baking with their own grandmas by sending in their favorite memories straight from her precious recipe box. 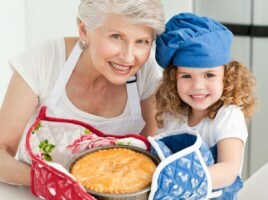 If you […]Read More Do you remember baking with your Grandma?